Right. But Silva is a key player for Manchester City whereas Mata's role is to be maybe our fifth best attacker. So why would you compare the two? He doesn't need to be anywhere near as good as Silva to be worth keeping for what he is. If David Silva was the benchmark then the average PL squad would consist of two players. If you wanted comparisons of immediate back-up players; our top 6 rivals have Mahrez, Shakiri, Pedro and Lamella. Further down the league you have Antonio (West Ham, although he regularly plays in multiple positions as a utility) and youngsters who are starting to forge a 1st team spot like Lookman, Demari Grey, Ibe and Sessengnon (to an extent). He wasn't quite there yesterday and when he got the ball he didn't use it effectively or efficiently. Still some time left before season end to show what he's about. Right on spot, there’s a romantic aura around Mata because he is a top professional always respecful of the club, but the statistics are cold he is not good enough at the moment and haven’t been for some time now. Ole: "Juan, can you follow me? I need to show you something outside." Mata: "We work hard. Commitment. Spirit." Ole: "That's it, just through this door." Mata: "Si senor, work ethic. What it means to play for Manchester." Ole: "Okay Juan, okay. We're almost there." Mata: "We regroup, senor. We strong." Ole has led Mata out the back door at Old Trafford, beside some old trolleys and dumpsters. He points at the ground behind Mata. Ole: "Look Juan, a PR opportunity to come across as a nice guy!" Mata, turning around to see, turns his back to Ole. Solskjaer takes out a pistol and whispers "You've been a good lad..." and somberly shoots Mata in the back of the head. "You've been the best lad....."
Such a nothing player. I can't believe we're actually offering him a new contract. Absolutely pointless player and it’s tad concerning our coaching team can’t see it to be honest. Makes us worse defensively and going forward. Way too slow. Couldn’t cover Young, who himself was a total shambles. Not good enough going the other way to make it worth it. Absolute waste of a shirt, the sooner he follows Fellaini out the door the better, never been up to it and the last reminder of Moyes’ reign. He played no worse than expected - still a very low level albeit - which makes you question the decision to bring him on more so than the player. Bernat could move further up the field in the second half, without worrying about the space behind him. Mata has no threat as a winger. This has been going on for to long. We asked him to okay os a winger, what do you expect? He should only be playing against Huddersfield, Cardiff and such. That's his level. Where did he play that second half? I couldnt figure it out. Lovely lad but he just isn’t a Manchester Utd player. Bernat was having so much joy down that left flank in the 2nd half as he was roasting Mata. He's past it. Renewing his contract would be a mistake. Now even offer nothings from substitute, make the team more worse at second half. Can anyone explain me why there are fans want to keep him? Just for their favourite, but not consider Man Utd future? Look at Man City bench vs Chelsea, and you will know what is the big difference between them and us. He should only be playing for Huddersfield, Cardiff and such. That's his level. Horrific. He’s been awful this season and is finished. Why on earth are we trying to renew his contract? I think I'm done with Mata, lovely guy and a top bloke but he's not a winger and he simply doesn't offer enough to the team. He doesn't fit into the system we're playing and unless there's plans to play him in the centre he just doesn't have the quality to play in another position. He offered more in his 45 minutes then Martial did, yet the response in this thread is fairly predictable. No point in playing him at all sadly. What is the point of brining him on and playing on the right? He drifts to the center and I feel sorry to see him struggling to try to match the pace of the game. Lukaku on the right or Rashford on the right with Lukaku upfront would've at least offered something. 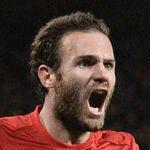 I usually have patience with Mata, but he os really a limited player. Just become very safe player. Exactly! He was possibly the only one who could have connected our midfield with attack and I felt he did do that pretty decently as well. A few of his passes leading to a half chance or so. He kept the ball well, something we were struggling to do throughout the game. When you defend against him you know he isn't going to run behind you. That's why a fullback will stay back more often than not when defending a Martial rather than a Mata. Bernat had such an easy time, and was unafraid to go forward once Mata was on. Even though you can say he got more touches than Martial, he just makes the team so easy to play against. I really don't understand why he was brought on, it's like we all knew what would happen but the coaching team didn't. Played in the wrong position so harsh to say he is rubbish but I don't think our club can ever okay with a "10". And yet we got way more joy down the right hand side in the second half then either of our flanks in the first, largely due to him actually being able to pass the ball accurately and having some decent movements. He even turned away players on a couple of occasions too. He’s not a good wide player. We knew it with Jose and Ole should know it too. He’s a pointless player in our current setup. Love the guy but it is what it is. Not the player for what should be a high energy game. We lost all momentum when he came on. We need better depth (and first choice) if we want to compete in the CL properly. We cant expect to make money on him so just let him leave for free and then free up his wages for a new player. He is about as poweful and explosive as a goldfishes fart. Same position he usually plays. Which is anywhere but the right wing.